TopCar is planning to make the pretty Porsche Cayenne Coupe look more aggressive. Porsche recently unveiled its answer to the BMW X6 and Mercedes-Benz GLE with the all-new Cayenne Coupe, and it’s arguably one of the best-looking coupe SUVs in the segment. Inevitably, aftermarket tuners think they can make it look even better. A few weeks after the car was revealed, Russian tuning firm TopCar has previewed an upcoming widebody kit for the Cayenne Coupe before the car has even entered production. Like the tuner’s other projects, the modifications will make the Cayenne Coupe look more aggressive than the standard model, as the body kit will add a massive diffuser integrated into the rear bumper along with a fixed wing at the back. We only get to see the tuned coupe SUV from the rear-quarter view, so it will be interesting to see what the front looks like. It isn’t known yet if TopCar has made any modifications under the hood, but some of the tuner’s previous projects have had some power upgrades so we’ll have to wait and see if the Cayenne Coupe gets a power boost. A new exhaust system, a remapped ECU, and an improved intake system could potentially increase the output close to 600 hp. In stock form, the 2020 Porsche Cayenne Coupe is powered by a turbocharged 3.0-liter V6 producing 335 hp and 332 lb-ft of torque, enabling the stylish coupe SUV to sprint from 0-62 mph in 5.7 seconds before maxing out at 151 mph. The more potent Cayenne Turbo S increases the output to 541 hp and 567 lb-ft of torque and can accelerate to 62 mph from a standstill in 3.7 seconds before topping out at 178 mph. TopCar already has plenty of experience modifying SUVs and sports cars. Most recently, the Russian tuner gave the Lamborghini Urus an aggressive carbon fiber makeover. 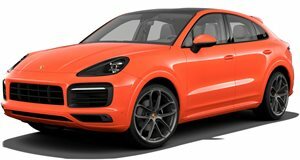 More details about the tuner’s take on the Cayenne Coupe will be unveiled in the next few weeks.